Defunct Audio Manufacturers - Z to 9 - audiotools.com. This Polish company has its origins in the Kasprzak radio manufacturer in the Wola district of Warshaw that was founded in 1951 on the basis of the old Philips Wola manufacturing plant and took over the produce of the AGA Radio from Diora Świdnica although there was parallel production for a short while. The company's name was formally “Zaklady Radiowe im. Marcina Kasprzaka w Warszawie” but that translates roughly as “The Warshaw Marcin Kasprzak Radio Manufacturing Plant”, and the company was named after Marcin Kasprzak, but he was a Polish revolutionary that was hanged in 1904 for killing 4 policemen a year earlier but later martyred by the communist government of post-WWII Poland. The company started manufacturing radios of its own design in 1953 and introduced Poland's first commercially manufactured tape recorder in 1958 and the first car radio receiver a year later. Their tape recorder products became quite well known in the west during the 60's due to their keen price, some of them sold under their own ZRK (Primarily in Eastern Europe) or ZK names but more frequently as an OEM producer with products sold under a variety of names including Marconi and Ferguson, some of these tape recorder actually were designed by German company Grundig and in the 70's when open reel tape recorder sales began to slow Grundig actually moved their production to the ZRK factory. The company became part of Unitra union at some point in the 1950's but their products usually kept on being branded ZK until the foundation of PHZ Unitra in 1972, in the west at the least, but after that most of their consumer products appear using the Unitra brand. The company was liquidated in the economic reforms of the early 90's as it was thought that it would never be able to compete in a market economy and the old factory has been refurbished and turned into an office block. Company that started trading in 1999 as “Zako Speakers Inc” but was incorporated in 2000 as Zako Audio and was based in Santa Fe, New Mexico, USA. Owned and run by Peirce Clayton who had prior to the founding of Zako run a company called “Fresh Baked Studios” that supplied cosmetics companies with ceramic containers but the loss of his biggest client in 1998 had prompted him to look into other markets for his products, but Mr Clayton’s primary experience was in the art of making pottery moulds and he had in fact published the book “The Clay Lover’s Guide to Making Molds” in 1998. BTW the idea of making speakers out of ceramic materials is not as nuts as it sounds, the material has remarkably similar acoustic properties to concrete, the latter being a long-time favourite of DIY speaker builders in search of something better than wood, the only problem being its tendency to ring. 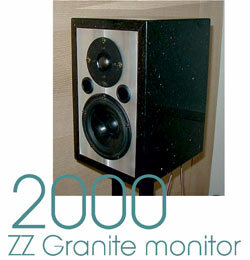 This resulted in the company releasing its only product in 1999, in the form of the Zako Audio ZM99 a bookshelf loudspeaker that uses a single coaxial driver that appears to have been made by SEAS, enclosed in a thick ceramic weighing in at 25 kilos per pair and initially selling for USD 1250, but after an initial flurry of interest sales appear to have been weak, the company did not manage to get any reviews in the hi-fi press and by late 2003 the company appears dead in the waters. Owner Mr Clayton worked as a teacher in his home town last time we heard and dabbled in a bit of Freemasonry on the side. A pioneering manufacturer of high end pro/semi-pro soundcards, run by engineer Greg Hanssen. Stopped selling cards in early 2001 when Mr Hanssen formed Energy CS, a company that develops technologies for electric cars. This German company is probably better known for their lenses and as the original manufacturer of the legendary Contax cameras, but perhaps less well known is that they did manufacture quality sound systems for movie theatre usage. Since quite a number of these were 2 channel units (rather than stereo per se) quite a few systems got a second life as home amplifiers during the 60's and 70's when the a large number movie theatres were forced to close down due to the advent of TV etc., this is despite the fact that these valve based monsters were the size of a small PBX. A company based in Gracefield, Wellington in New Zealand that manufactured mid & high end music amplifiers under the McLaren brand although its main business was acting as an OEM and contract manufacturer of electronic equipment for the communication and security industries, the stringent import regulations and high import duties in New Zealand at the time meant that products that would normally have been imported had to be manufactured locally either by default or to be competitive. Zetka appears to have started producing hi-fi products in the latter half of the 70's, with the 02 series is believed to have been introduced in the early 80, but products from that series including the 402 preamplifier and the 902 monoblock are the ones most likely to find outside of NZ but for a time they were exported to Europe but later products were mostly sold in their homeland. The 03 line of amplifiers that was introduced in 1988 and included the 603 preamplifier, a 703 stereo power amplifier and a 903 monoblock power amplifier, however remains the company's best know products and are fairly common. Zetka went out of business in or around 1995. Spares & service : Bruce Crothers who was the principal designer of the 03 series of amps has been offering service for the McLaren line of amps but I have been unable to dig up a contact address. Small comany based in Grand Rapids, Michigan, USA. Made valve based "sound enhancers" that got a bit of attention in the US audio press, first time we hear of their products is around 1996 but contact lost in 2002 or so. A long running British manufacturer of blank tape, it's usually classified as a Scottish concern but the only address found was actually in Redhill in the south of England. Produced tape from the 50's into 1999 when they announced their intention to leave the media business. It is unclear if the company is still in operation. UK trading company based in Stockport in Cheshire that was run by Darren Cragg who had previously run Source Manufacturing Ltd. and was connected with Smoke Company. The company was founded in 2005 just after Source Manufacturing went out of business and continued the same basic business model of selling re-branded Asian sourced lighting products intended for the DJ and entertainment markets. Company went out of business in 2008 and was liquidated, but owner Darren Cragg founded LED Technologies later the same year. A company founded by Michael Bailey in 1998 and based in Las Vegas, Nevada, USA. Initially manufactured high end interconnects and power cables although it added loudspeaker cables and a very expensive small standmount speaker after 2000 (list USD 4999 in 2002, 5999 in 2005), the loudspeaker was notable in that it had a baffle made out of slabs of solid natural granite and was usually just referred to as the "Graphite Monitor". Note that the company sometimes used Z2 or ZZ when referring to itself and cables usually have a ZZ logo on them. The cables were slightly unusual, they were made out of 5 strands that had been hand braded and self screened much like a twisted pair cable, the strands were made of either pure silver or gold wire (on model had both silver and gold) and taking into account the basic raw materials, they were not terribly expensive all things considered. According to the company's website the reason for the braiding was that properly screened cables were actually rare in high end cables and created problems in installation scenarios, so a self screening cable was preferred. In 2002 the company announced that they would be introducing a line of hi-fi furniture, also made from solid natural granite like their speakers, although that never shipped. The Z-Squared Inc. company was closed down in 2003 or early 2004 and the operation was moved to Cleveland in Ohio, where it was run by Ronald J. Dombrowski who appears to have held out the operation as a sole trader, but it is not known if the operation was sold off to him or if Mr Dombrowski had been a partner in the original company. The Cleveland operation initially sold the exact same product line as the earlier company had sold although it hiked the prices up somewhat. In late 2005 Mr Dombrowski replaced the entire cable product line with cables that were a more conventional designs that featured wire either made out of copper or copper-silver-gold alloy with gold plating, this was not popular with the punters and at the least one of the dealers selling the Z-Squared cables introduced their own line of cables that resembled the earlier line somewhat. In late 2005 the company also introduced a high end power conditioner. The company suddenly stopped production in late 2006 and the website disappeared off the net with no reason being given, but Mr Dombrowski has since founded another company with the Z-Squared name that is active in the health industry and the Granite loudspeaker is now being made by Brass & Granite Audio. 3M See --> Minnesota Mining & Manufacturing Co.
Canadian manufacturer of mid and high end horn loudspeakers sold under the Gemme Audio brand, in addition to boutique horn loaded speakers sold under Atelier Audio anme . Originally founded in 2005 by Robert Gaboury and Jean-Pierre Boudreau and was based in Saint-Hubert, in Quebec. Mr. Boudreau left in 2009 and the company appears to have gone into administration in 2011. Note that the latter gentleman has been asked by the administrator of the company to get rid of the remaining stocks of Gemme Audio products and he can as of October 2012 provide you with speakers at as low as 1/4th of the original RRP with a one year guarantee, he can be contacted as jpierreboudreau@gmail.com or via telephone on +1 450 472 5908.